I'm going to add another piece to our business. In limited quantity, I'm going to make the Ribbons and Bows Jumper to sell. It has small floral embroidery along the top and bottom edges of the skirt ribbon. I tried to get a photo of the embroidery, but in order to zoom close enough my camera seems to blurr. I've had so many people say that their daughter would love to wear this, but they're not going to sew it, so I decided to give this a try. We're featuring Sis Boom Basics by Jennifer Paganelli in the Ribbons and Bows Jumpers. This is 100% cotton fabric and honestly doesn't need an iron. It washes great. I wash it in cold and then dry it slightly and hang it up to finish drying. It may need a shake after pulling from the dryer, but that's all. The cost of the dress is $20 plus $5 shipping to anywhere in the US. The dress pictured is a size 8. 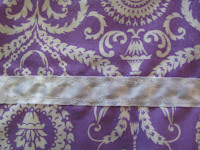 It measures 28" from the top of the shoulder to the hem. You can pay through Paypal. Post a comment with your interest, and then I'll give you instructions on how to pay. We won't be making very many...I simply don't have the time. My little girl still needs Spring and Summer clothing made and she wants some of the SisBoom Fabric, too. 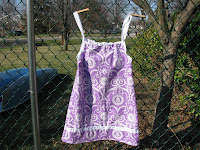 My little girl is very excited to have helped create a dress that another little girl may wear. And don't forget....the pattern contest. You can read about how to enter in the post below. It ends Friday. Someone is going to win a pattern of their choice...now or to claim in the future.